A few years ago, I was at a garage sale when I came across what was left of a young girls bedroom set. You know the kind ... back in the 60's or 70's when every little girl wanted a big canopy bed with the matching desk, dresser and chair! I picked up the dresser, desk and chair for the bargain price of $10.00 for all three pieces. The finish looked like an antique white with these little blue and yellow flowers on the drawer fronts. Not exactly my decor style so I proceeded to paint all three pieces white. 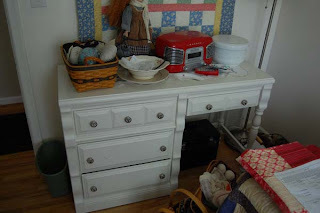 The dresser and desk were both missing knobs ... they were those white porcelain knobs with very vintage feel. I took the knobs from the desk to fill in the missing spaces on the dresser; and replaced the desk knobs with new "brushed nickle" ones. My my recently made the decision to move from Michigan to Minnesota and will be moving in with me and hubby. As a result, I needed to empty our office/paper crafting room and guest room so they could both be painted and refinish the floors. Mom will end up in the former craft room and my craft room will move to the former guest room. (Hubby's office moved to the basement.) So, I had to figure out what to do with this little desk. I didn't really have any room for it anywhere else in the house, but I didn't want to get rid of it. What should I do? So I started thinking .......maybe I could cut off the right side of the desk and just keep the half with the drawers. So hubby and I got to work. After a little bit of wood putty, sanding, priming and painting ... then a little bit of distress work .... we came up with this little beauty! The new "chest" now resides in our living room next to my chair where it hides my knitting projects as well as some other needlecraft handwork (embroidery and English paper piecing). I really love how it turned out. What have you recently repurposed in your home?